Those first few weeks are EXHAUSTING aren’t they? Each year I get a little better at preparing for those beginning days. I’m hoping I can help you, too. I have an editable back to school parent guide for you. My first grade team does an hour-long Parent Information/Back-to-School Night during the week BEFORE school starts. Our Kinder and TK teams do this as well. Things are just so different for this age group than it is for 2-6 – so we need 1. the extra time, and 2. to nip things before school even begins. There are always two teachers on duty for recess, but not always your child’s teacher. Please send a little snack with your kiddo, but make it small because they are quickly eating while standing near the trash can on the grass and then NEED TO PLAY. They have less than 15 minutes for recess. Don’t send a 3-course meal. We have noon duty aides that watch the children during lunch – both the kiddos and teachers have the same 35 minute lunch time. Try to be early to pick up your child…in the correct location. The kids freak out a little with all the end of the day commotion. First grade kiddos enter and exit campus at the same place and time as those big kids. Of course, we also discuss common core, our academic, homework and behavior expectations. In an effort to help simplify the HUGE amount of information, each parent will receive a copy of our parent guide. I am a firm believer the more info you give your students’ parents, the better. We all want to be “informed”. Parents are no different. All this info serves as answer to many of their questions, a quick reference when they are unsure, AND a reminder that first grade is demanding! We do our best to include as much detail about the key things without being too overwhelming. Most importantly, throughout the evening we remind parents that 1st grade is a joint effort and we need and appreciate their support. This resource includes several color options – including ink saving black and white. This is an editable file. I’ve included my guide so you can see exactly what I include. The content areas are all editable on this parent guide, the headers/titles are not. Another thing we do is send out a 1st Day Guide letter to our 1st grade parents. It accompanies that big packet of forms they pick up before school begins (either at Meet Your Teacher morning or Back to School Night). This will help those who were not able to attend our Back-to-School Night and it will serve as another reminder about how the first day will go and supplies we would love donated. AND… as if that’s not enough…on the first day of school, the kiddos take home a WELCOME letter. This way, even if they didn’t come to back-to-school night, nor Meet Your Teacher – they will STILL have some important information. (The first day guide is shown on the bottom right of the image above. The welcome letter is the upper left example.) I’ve made these templates editable so you can make your own set for your class. Ok… YES… this is OVERKILL – but it sets a tone. I want my parents to know that I will do all I can to keep them informed. I like everything that goes home to look professional. 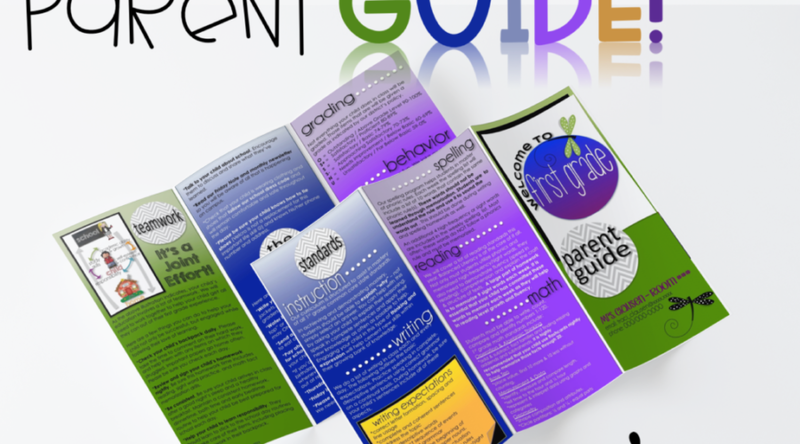 You can grab the Editable Parent Guide in my store. The FREE Welcome Letter and First Day Guide are in my store as well! My goodness…what a FABULOUS freebie!! Absolutely amazing! It looks so PROFESSIONAL!!! I LOVE this and edited it from my Macbook at home last night. When I opened it up on my school computer everything was really messed up. (Still getting used to this Macbook thing!) Since I cannot access facebook from my school computer, I was hoping you could privately email this document to me. I would greatly appreciate it so I can work on it at school this time! [email protected] THANK YOU!